This is a Christmas card design from several years ago... our oldest was in her "everything blue" phase and our youngest was in her "everything purple and pink" phase. I love this design because it reminds me of the need for quiet moments. 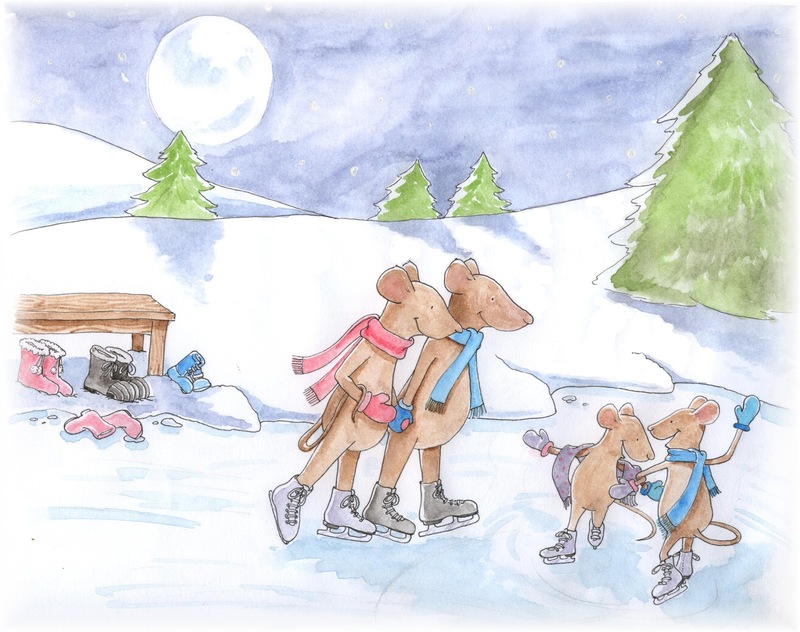 When I look at this painting I slow down and I begin to feel the crisp air and I hear only the sound of the girls giggling and the sound of skate blades running atop the ice... and then after a few moments I can't help but release an exhalation of relaxed contentment! I hope as the holidays rush upon us that we will each have time to slow down enough to hear the sound of children laughing, the snow squeaking under our steps, the comforting crackle from the fireplace, and to observe the beautiful purple-blue shadows that stretch across the ground, the diamond-like twinkle of snow on the branches, and to feel the true warmth of a hug from a loved one! God has blessed us all! May we share His love and truly reflect His shining light to everybody we meet this holiday season - making it a joyful time of year for everyone!